Medulin is a lovely, family-orientated resort only around 8km south-east of Pula. It’s a great place to base yourself if you fancy being somewhere that’s a bit more of a holiday resort, but within easy distance of the wonderful architectural sights of Pula. If you have your own wheels, it’s also a great place to use a base to explore southern Istria – for example, Cape Kamenjak. Medulin is home to a 1km-long sandy beach called Bijeca. It is reasonably shallow, making it ideal for those with little ones in tow, and you can rent sun loungers and umbrellas. Local bus number 25 runs between Pula and Medulin – you can look up the timetable on the Pula Promet website. Journey time is 40 minutes; there are fewer buses on Saturdays and Sundays (and holidays). 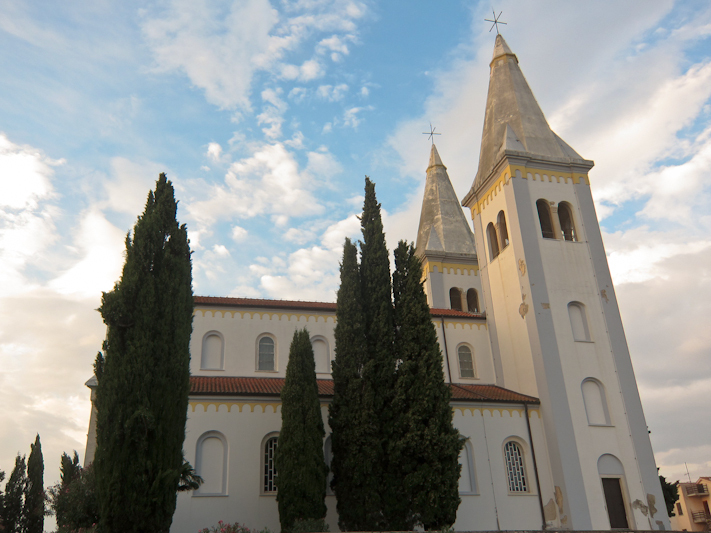 It is easy to reach Pula from other locations in Istria and Croatia – the Pula Tourist Office website does a good job of collating all bus timetable information on this page. There are also international services to Pula from Italy (year-round from Trieste and Venice, and Milan in summer) and Slovenia (Ljubljana – summer only). As Medulin is a small town with more of an emphasis on being a holiday resort, there’s not many sights around. One of the town’s main features is St Agnes Church, with its twin bell towers (picture above). 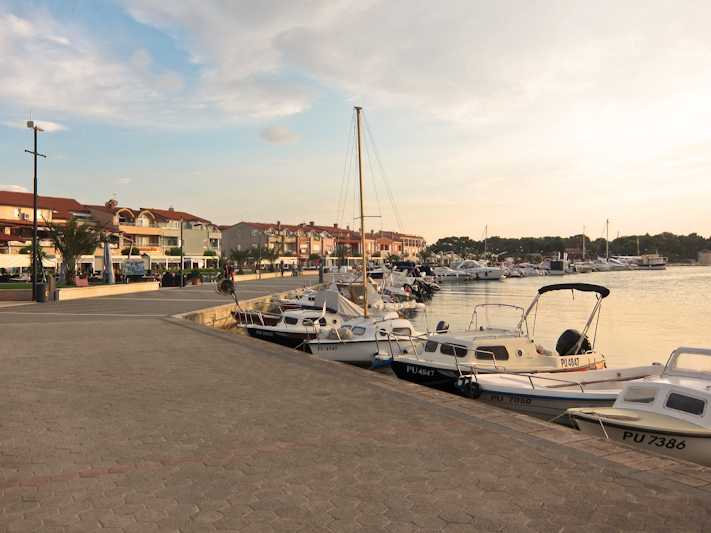 Not especially a ‘sight’, but somewhere where everyone gathers, is the town’s main promenade. Head down in the early evening and join the locals and other holidaymakers in strolling away to your heart’s content. There’s a number of restaurants, cafes and bars here, plus plenty of ice cream vendors, stall holders (selling little knick knacks) and souvenir shops. Medulin has a good selection of hotels and private accommodation. For hotels, there’s the recently renovated, 4-star Park Plaza Belvedere Medulin, and the 3-star Hotel Minerva. You can search for hotels and apartments in Medulin with Booking.com, and do also check out our Accommodation in Medulin page. There’s a decent selection of places to eat in Medulin, although many serve up the same kind of fare – fish, pizza, pasta and meat dishes. Probably one of the best restaurants in Medulin is Salt & Pepper (Sad 138, Medulin). Located right at the end of a stretch of restaurants on Sad (the road that runs along the sea), this quirkily-decorated restaurant has amazingly friendly service, and a range of dishes with a unique spin. Go for one of the fish options! Octopus (Funcana bb, Medulin) has a great location on the beach promenade, right by the sea. It’s certainly got a great ‘holiday’ vibe, with outdoor seating underneath a plant canopy. It’s a great option for a quick bite to eat for lunch with a cold beer or a relaxed dinner. Koral (Osipovica 13, Medulin) is housed in the hotel of the same name – with a pleasant outdoor terrace overlooking the beach, there’s also a cosy, wood-furnished indoors that’s great if things get a little rainy during your hols. Service can be a little on the grumpy side of things, but the food is tasty and hearty. Try the stuffed squid, or the gnocchi or fuzi with goulash. Boccaporta (Pomer 26, Pomer) is actually located in Pomer, around a 15-minute drive away from Medulin. The decor may not look like anything much – especially with two large outdoor screens showing Croatian entertainment shows or sport – but the food definitely makes the trip worthwhile! Pomer’s home to a large marina, so Boccaporta tends to be very busy during summer; it’s where those that have sailed into town head to be fed. Unsurprisingly, you can’t go wrong with any of the fish dishes. There’s a large Plodine supermarket on the outskirts of town if you need to stock up on food and drink. There’s also a small Konzum right in the heart of Medulin, plus a Kozmo pharmacy. ATMs can easily be found in the main part of Medulin. Find out more about Medulin on the Medulin Riviera website.